Hello! I have finally made a video with my tips and tricks for Hexaflexagon making! I put patterns and the video series on vihart.com/hexaflexagons. I’m super excited about these shirts because I finally came up with a shirt idea that I’m happy with, something fun and useful that can help spread the joy of math. I could never bring myself to sell some boring branded shirt that I don’t feel adds more to the world than any other random shirt, and I also wouldn’t want to do it unless I could have shirts available for a range of body types, which isn’t generally the economic thing to do. 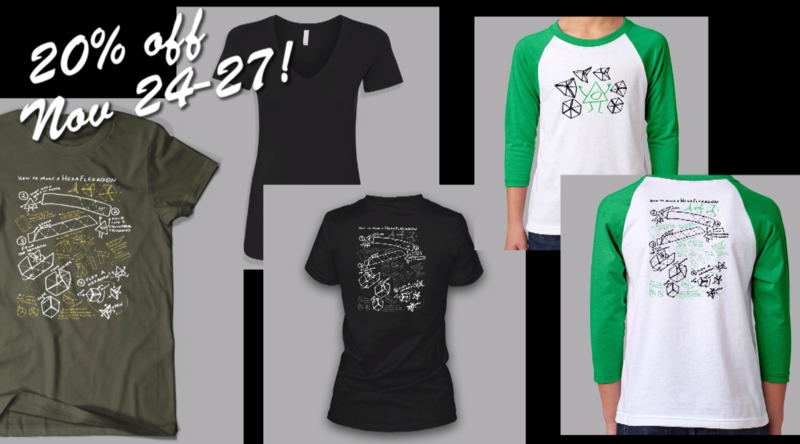 But we’re proving that well-thought-out ladies and kids shirts can sell! In fact, some of the sizes only have a handful left in stock. So it’s all very exciting, and between that and the Patreon I’m doing fine, and thanks to people hopping on board my Amazon wish list I’m re-stocked with the supplies and equipment I need for my December projects! This entry was posted in Uncategorized on November 24, 2017 by vihart.